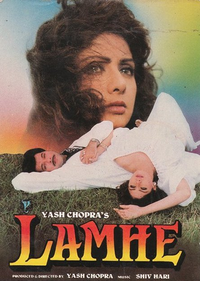 Review Summary: An iconic film, way ahead of its time, 'Lamhe' explores the forbidden nature of love. A Yash Chopra classic! For once, we think Anil Kapoor was miscast. That is, his performance is fine (if subdued to the point that we wondered if he was on Valium) but he's both too old to play the fresh-faced youth Viren and too young to play the aging, gray-sideburned Viren. Lamhe is one of those films that stand witness how little the box office results tell when it comes to the quality of the film. A film to cherish. And the best film of an iconic director. Although, Lamhe wasn’t much of a success initially, it later went on to become a classic Bollywood film and has won many accolades! Today, however, Lamhe is a cult classic, and it’s another fine example of Chopra’s romantic expertise. As it happens, I do not hate Lamhe. But I do not particularly like it, either. I suppose that in its time - coming as it did in such a dire and violent era for Hindi films - it was refreshing, different, exciting.